Alesis MultiMix FIREWIRE 12-Channel MixerAlesis have had great success with the MultiMix mixers featuring FireWire connectivity and MultiMix FireWire 12 Studio Mixer is part of the series. Allowing for fast transfer of multiple audio data streams from mixer to PC the MultiMix FireWire 12 Studio Mixer provides lightening fast connectivity to a wide range of PC-based audio production and recording software applications. The emphasis is on compact mixer design featuring low noise analog processors and studio-quality 28 bit digital effects. The construction is very sturdy and the mixer boasts high-gain mic and line preamplifiers, auxiliary send/returns, phantom power and a built-in FX engine including reverb, delay, chorus, flanger and a 3-band Equaliser per channel. 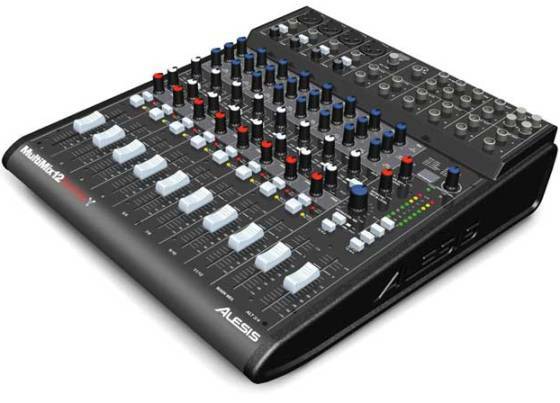 Additional features of the Alesis MultiMix 12 Channel FireWire includes balanced main and monitor outs, integrated FireWire ports that transfer audio between the mixer and your PC and standard 24-bit stereo simultaneous input/output with a FireWire 1394 connection. Windows XP and Mac OSX plug-n-play operation is supported. The FireWire mixer also comes bundled with Cubase LE, which is a nice bonus if you are just starting. Alesis specialises in making multi-track recording viable and affordable for the home recording studio. 2 stereo balanced 1/4 line inputs, aux send to onboard or external effects and stereo aux return.